March is a prime sowing month for autumn and winter crops to set yourself up for an abundance of tasty winter veggies. Read our guidelines for what to sow, as well as tips on protecting your plants and trees from pests and keeping your garden in shape come winter. Plectranthus thrives in cool areas, so choose a site that’s shaded by overhanging trees. It grows well in well-composted soil and requires water only every few days. After flowering, feed every two weeks with an all-purpose, water-soluble fertiliser that is low in phosphorus. Sow sweet peas, hollyhocks, primulas, poppies, pansies, Namaqualand daisies, calendulas and snapdragons. 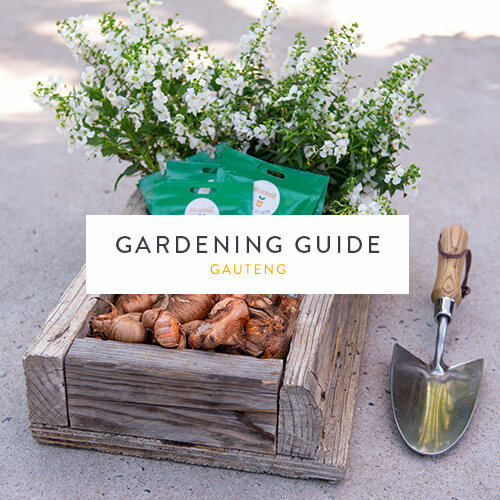 Begin your veggie garden by sowing leafy greens such as lettuce, spinach and Swiss chard and cool-season herbs such as chives, rocket and calendula. Grow easy root crops like carrots, broad beans, beetroot and radishes. Try your hand at brassicas by sowing broccoli, cabbage, cauliflower and kale. Feed your lawn with chemical-based Wonder Lawn & Leaf 7:1:3 to keep it green and lush going into winter. Replace lost nutrients with organic Atlantic Bio Ganic Lawn (also a waterwise option). Feed your garden with Wonder 3:1:5 or 8:1:5, or opt for organic-based Atlantic Fruit & Flower or Atlantic Bio Ocean. Use Protek Complete 350 SC for sucking and biting insects such as red scale and whitefly. Check for scale along the stems and on leaves of citrus trees, and treat using Efekto Oleum or Efekto Malasol. Dust bulbs with Efekto Bexadust to protect them from worms. Sprinkle Efekto Insecticide Granules around each plant. Lightly trim plants that may be out of shape or overgrown. This will give them time to harden up before the cooler weather arrives. If your lawn is old, feels sponge-like, and is difficult to mow without ‘scalping’, cut it as low as possible by crosscutting and lowering the blade after each cut. This will get rid of the layer of dead thatch hiding between the soil surface and the green top. Compost areas cordoned off for new planting and where soil needs added nutrients. Mulch around azaleas, hydrangeas and camellias to keep the roots cool and moist. This will also help to fight back weed growth.